I feel like I'm in school, and I have a paper that's overdue. What to write? CD Reviews - I have several choices, but I just did one of those. Politics? Blah. I'll dance on the graves of "Well Intended Public Servants" later. Clemson football? I'll wait another month until I'll likely be miserable enough to rant. So, that leaves... just an observation. I have somewhere in an appropriate archive a 20 plus page paper on Y2k and, at the time of its writing, the future implications for society written by no less a technological powerhouse than Raytheon. Corporate write-downs for Y2k analysis and upgrade expenses were enormous as "old" was replaced with "new." At a more observable level, people were stocking their pantries with canned foods and bottled water, buying survival guides, and relocating, in some cases, to the mountains to avoid the end times that were coming when the lights go off for good and ATMs quit working. I also vividly recall toasting the New Year with... well, indifference, as it interrupted a card game, only to find out that, hey, the TV still worked at 12:01. And it worked just as well some hours later when college football enjoyed its annual day of dominance. Y2k is a prime example crying "Wolf." Each time a hurricane turns a bit left or right or slows down, many who were incovenienced look back and say... "Fool me once, shame on you. Fool me twice, shame on me." Shame on those who don't recognize a wolf and have sense enough to give it free roam. Sorry, folks being rescued at Galveston, TX. It's really hard to feel sorry for anyone whose sense of self-preservation fails to move their rear-ends out of harm's way. And for New Orleans, I'm sorry too. We can point fingers at the ineptness of government at all levels, but, hey. You live in a city that is below sea level, located by the sea. I know it's much more complicated than that, but I'm still amazed at the numbers of people that decided it was in their best interest to actually return. Why is that? I think we're soft. When a snow storm threatens Georgia, everyone goes to the supermarket and buys milk and groceries. Why? We're not sure, but it's what we're supposed to do. There's a news reporter from every channel reporting that, "yep, it's all gone folks! Back to you in the studio." That's not really a help. And that's just a hiccup in the vast possibilities of interruptions to the routine. We're spoiled rotten. It used to be an inconvenience when the power went out for half a day. Now we're outraged if the Cable TV is interrupted during our favorite program. And heaven help us all if the internet is cut. Forget all that "nice to have" stuff. It's about fuel. Our elitists can debate the utter irrelevancy of agrarian societies in a modern world and our post-industrialism expectations of information and technology meeting our needs above yester-year's focus on nasty, sweaty, anti-environmental manufacturing. We want our daily shower, our microwaved foodstuffs, our evening entertainment, and, please, no panhandlers on the street. Clean. Easy. Convenient. The hallmarks of modern life. But, when the chips are down and the computer is out, we want food on our plate. Advantage: agrarian society. In one day, due to Hurricane Ike, gas prices locally soared from $3.68/gal to $4.89/gal, at least that I personally observed. As such, we pay at the pump, counting on a return to "normalcy" in the coming days. How many stop to think about "what if?" 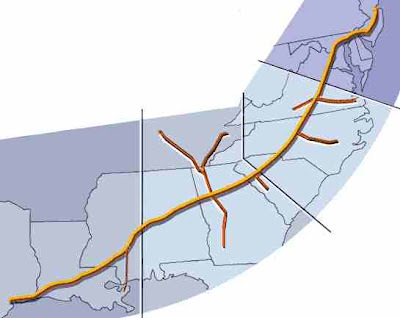 Exhibit A: Colonial Pipeline's Southeastern Supply. Turn off the pump at the lower left, and we've got trouble. The Racetrac location below tends to have the cheapest gas each day on my 28 mile daily commute. It's normally filled with cars. Not for several days this past week. BP, Quiktrip, and others were out of gas for much of the week, and most stations that had gas didn't have all blends. Colonial wasn't pumping for a while. Most of us rely on the expectation that what was once, shall be again. It's a false sense of entitlement, and it requires fuel to supply our power plants and to fuel our transportation systems so that food can move from the farm to the fork. In commercial insurance, we ask our clients to create a business interruption plan, which is a formal plan on restoring their commerce in the event of fire, tornado, etc. If they can't preserve their business clientele, it's hard to start over when the bricks are finally replaced. The vast majority have not done so, expecting that intelligence and experience can put Humpty Dumpty back together again. To that we say, ask a Floridian what it's like getting a simple roof replaced when 400,000 others need theirs replaced as well. Supply ≠ demand. We're good at dealing with setbacks at an individual level. Our society is built to give aid. But at a macro level where hundreds of thousands, or millions, are affected, we're woefully unprepared. Isn't that rather amazing that we can listen to threat of ebola or Avian flu, and say to ourselves, "It won't happen here." Why not? It's not convenient for us. We're Americans! From the comfort of our living rooms, we can watch looting on TV from a natural disaster or other interruption to a police response, but we expect that "we'll be okay" if it happens here. Why? We have been so far. And as long as the fuel keeps coming, we'll keep thinking the same. I think alot of the laise-faire attitudes have to do with the lack of anything "bad" happening. Ask a Floridian several years ago about Hurricane season, and we would give a delicate shudder, sniff loudly and just go on about our business. Then we got hit, and hit, and hit, and hit some more, one right after another. Now, they say a storm is coming in, we have the water bottled, the batteries stocked and the generator gased up before the Hurricane has a chance to clear Cuba. All it took was a little hard proof that we weren't immune. Look at what happened when Gustave headed for New Orleans. Millions said, "Well, we are outa here." False alarm, but they learned the hard way. Let face it, unless it happens to us and not just around us, we don't learn. Part of it may stem from the historical evidence. If we want something badly enough, we can get it done. Native people, shove them over. Oppresive crown, chuck their tea. Every child is taught growing up that they can be president someday if they want it bad enough. The American Dream is all about doing better for yourself and your family. You can't be optomistic and plan a better future, if you are constantly worring about what might happen or the things that stand in your way. Look on my works ye mighty and despair!"